It's me Shartina! I recently had to take time off from work at Vidicom, a company founded by Christy Ferer, due to the flu. Many people (including myself) will try to work sick because they truly enjoy their jobs and co-workers but working while under the weather is the worst thing you can do for your co-workers and the company. Since I am new to Vidicom, I felt even worse that I had to take time off but in actuality staying home and getting better is also apart of displaying characteristics a devoted employee. Healthy employees is a company's greatest asset. While at home missing all the action in the office, I made some comfort food. Many people run for soup but I was not in the mood for a watery meal. 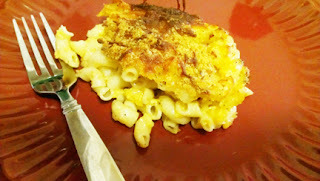 Instead of soup, I made baked mac and cheese. The crunchy topping of the cheese and bread crumbs complimented the gooey mixture underneath. Normally, I using make this dish with extra flour during the holidays so each serving is a perfect cube. Perfect cube servings makes it easier to serve especially to a full house. Here is the recipe that I used but feel free to make changes. I will add some helpful tips that will allow you to make it your own. In a large pot, add salt, pepper and water, bring water to a boil. Add elbow macaroni to boiling water and cook pasta to your liking. Strain pasta and pour in to grease 9 x13 baking dish and set aside. In a sauce pan, pour milk and bring to a boil. Reduce heat and add mustard, salt and pepper. Slowly add cheese to sauce pan and stir. Slowly add flour until sauce thickens. Pour cheese sauce over macaroni and mix sauce and pasta together. Top the dish with shredded cheese and bread crumbs. Place the dish in the oven and bake for 20 min (uncovered) or until the topping is golden brown. To make you mac and cheese pop, experiment with different cheeses. I used extra sharp & sharp cheese with an Italian cheese topping that included mozzarella, Asiago, Parmesan and Romano. Add veggies like spinach or chopped broccoli. Or diced ham or crumbled bacon.